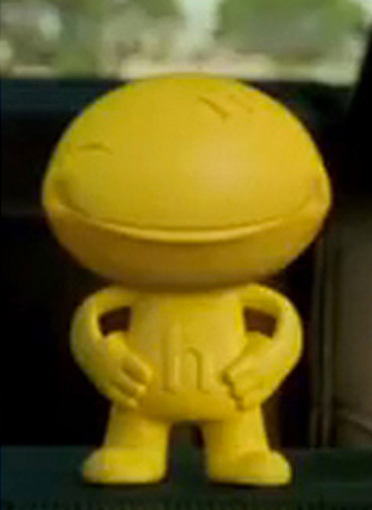 ‘Horatio’ is his name and he represents the Hertz Car Rental company in their latest advertising campaign. 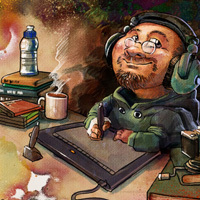 The man behind this new icon is one of our own: Rein Lohse a.k.a. Spaceranger – one of our loyal members and moderators! We asked Rein to tell the story behind Horatio, explaining how an idea comes to life and to show the creative process involved in the birth of a worldwide advertising campaign. 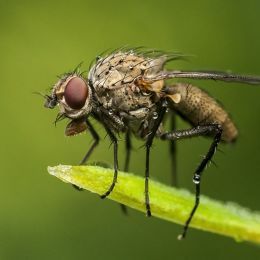 It’s true that Photoshop offers even non-artists the opportunity to create images once limited to the trained illustrator but if you really want to become a professional Photoshop artist I still recommend you study traditional art, even if you don’t have drawing skills the knowledge will aid your work in any drawing program. Composition, layout, anatomy, technique, painting styles etc., are all most helpful to create better images. Photoshop is used in many areas of commercial art and advertising, for this article I’ll use a recent project as an example that was also a fun assignment for any artist. I’m a professional artist trained in traditional art methods. 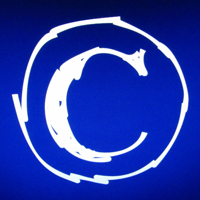 Because of the increased use of computers in advertising it became necessary to learn Photoshop. I never took classes in computer or Photoshop and learned basics from my friend and colleague Vic Spadoni who you may remember as Vicspa from the old PST (Photoshop Talent) days. Vic turned me on to PST as a great tool to learn…he was right! I owe a great deal to PST, now Pxleyes for providing a diverse learning experience and increasing my skills while having fun doing it. 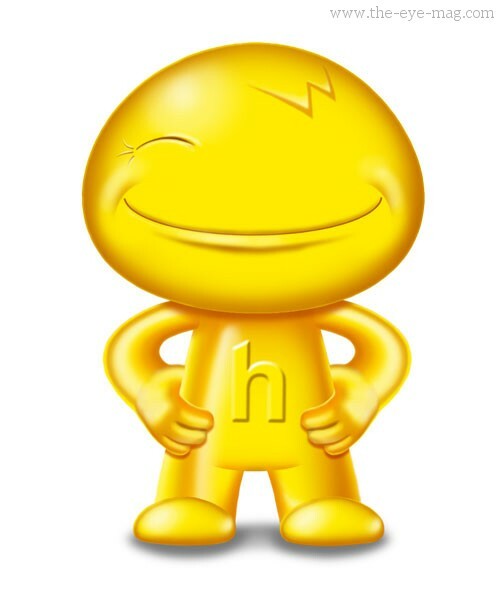 Back in February 2011, Hertz, the well-known car rental company, wanted to create a mascot for their companies advertising. 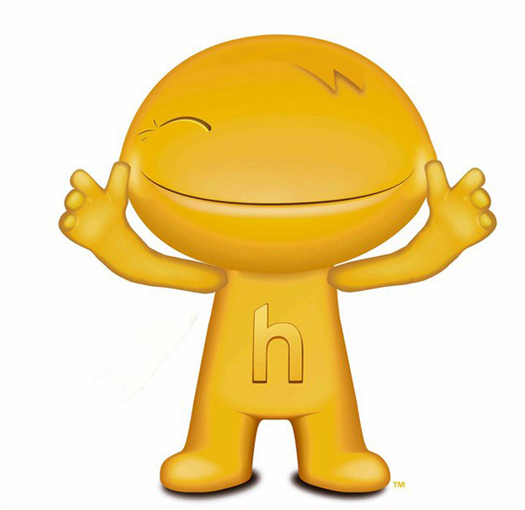 Iconic characters and mascots have been a main stay in advertising for a long time. Characters like Speedy Alka Seltzer, the Pillsbury Doughboy and the Michelin Man to give a few examples. Creating the right character is important to the product identity, the creation must be iconic and be readily identifiable with the company. Doyle Dane Bernbach (DDB) was the New York based Ad Agency who searched for an artist to help with the project. Having seen samples of my work, which included some of my contest entries, I was chosen for the assignment. Some of the contest entries shown to the client that influenced their choice of artist. The work begins with a conference call with the art director and the art buyer from DDB. We discuss the particulars about the character and the use in various formats. The client provided rough sketches of some concepts then talked about mixing and matching different ideas, this meant there would be at least a dozen versions to create. Throughout the project we would confer about what changes should be made and in all it was the exchange of ideas that lead to the final result. Every aspect was discussed, the head shape, the body shape, the proportions, the pose and the expression. Because I was working in Photoshop I could render each of the elements separately and put them on layers. This way I could simply turn off one layer and turn on another while the rest of the image remained the same. 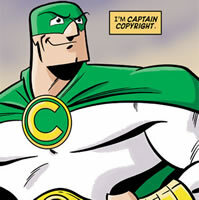 I could provide the client with a jpeg of each version without having to redraw the character. 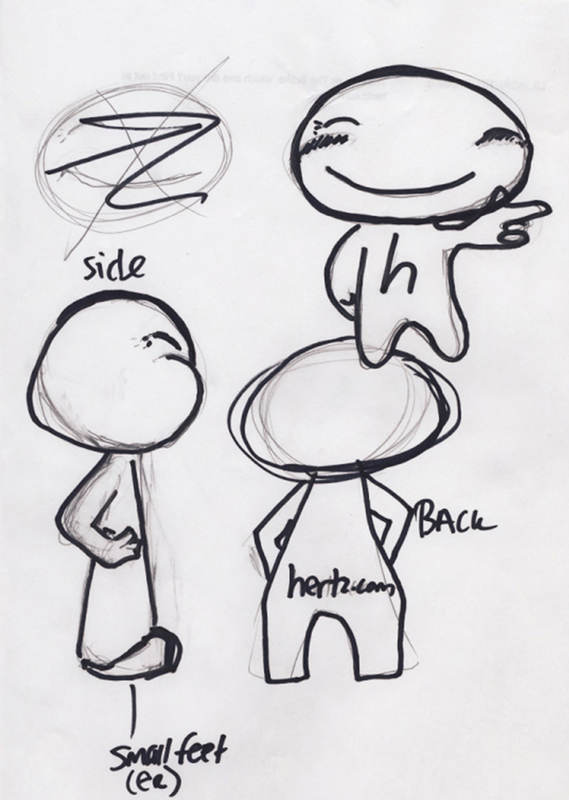 The first major change was in the head to body proportion, at first we weren’t sure if we would go with a more realistic ratio like the Michelin Man but it was soon decided to go with a big head smaller body and so the project became known as the “Bobble Head Project”. The “wink” was the next issue, one eye… both eyes… eyeballs… open mouth… teeth? Ultimately a simple one-eye wink was the choice with a closed mouth smile. 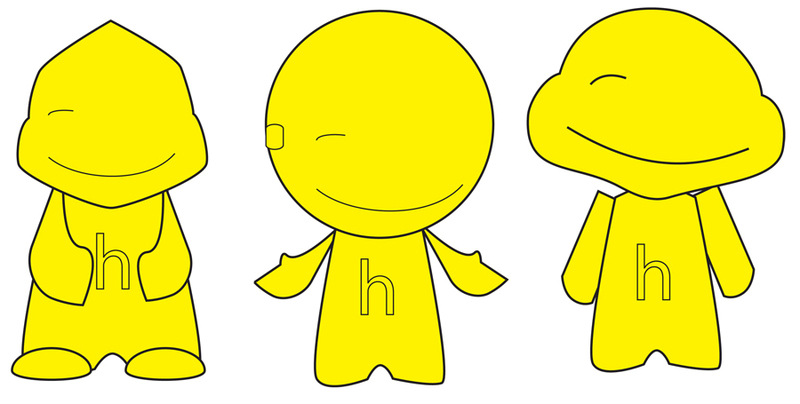 Additional client sketches for bobble head version. 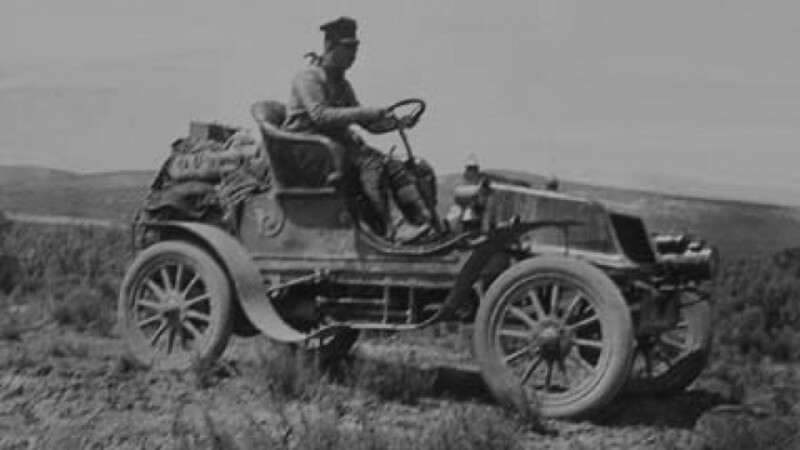 The little fellow was named Horatio after a physician, Horatio Nelson Jackson who was one of the first people to drive a car across the United States. Now variations of the big head were needed, the body pose and proportions were established so next I had to create three positions of the character in front, side and rear views. The three body poses became my second layer with a black to white simple gradient for the background. 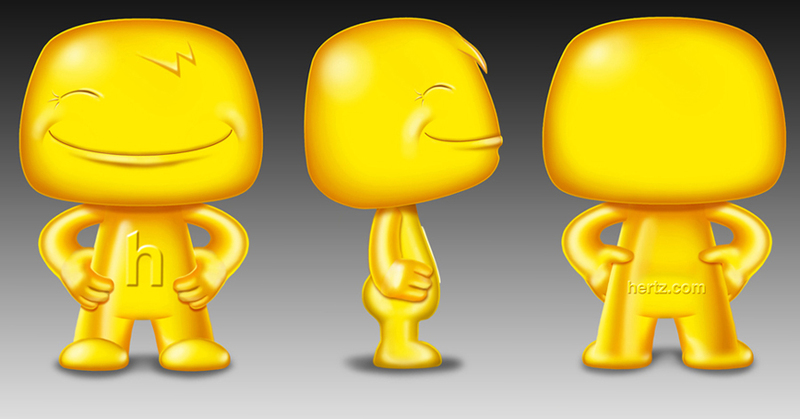 I next created each head style for each pose and placed them on several layers over the bodies. 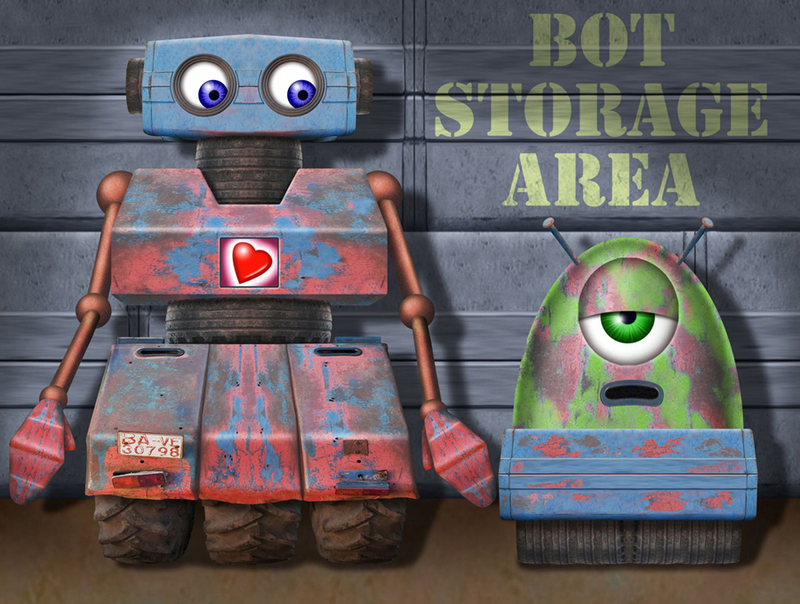 Some of the many versions created. Once complete I would make a jpeg of each version to provide to the client for final approval and selection. The creative group at DDB met in conference and the final version was selected. My last task was to provide the client with a PSD of the final version and a high res jpeg. 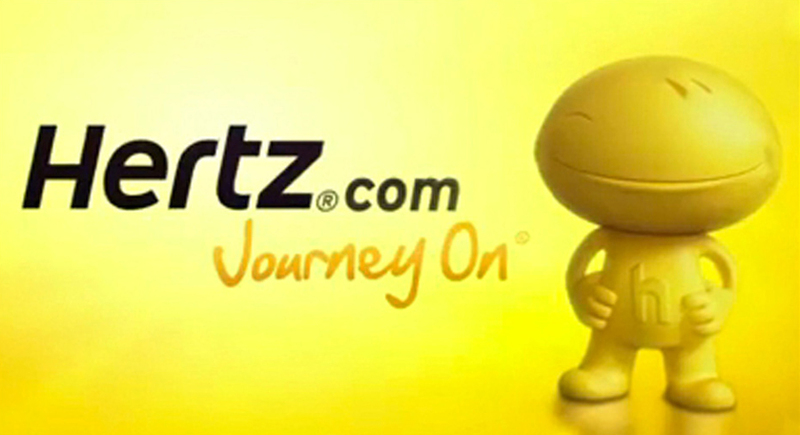 The presentation by DDB was successful, Hertz loved the Horatio character we created and the campaign was under way. 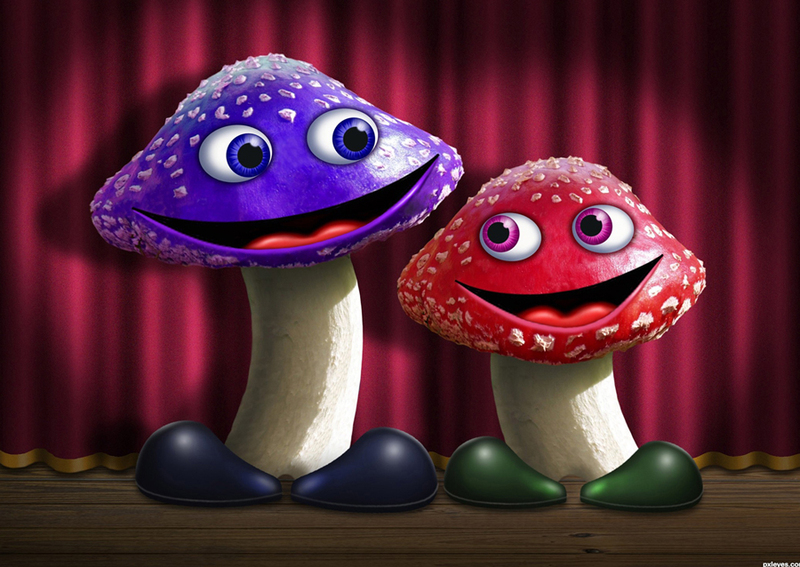 Frame grabs from TV spots and press release 3D test version. 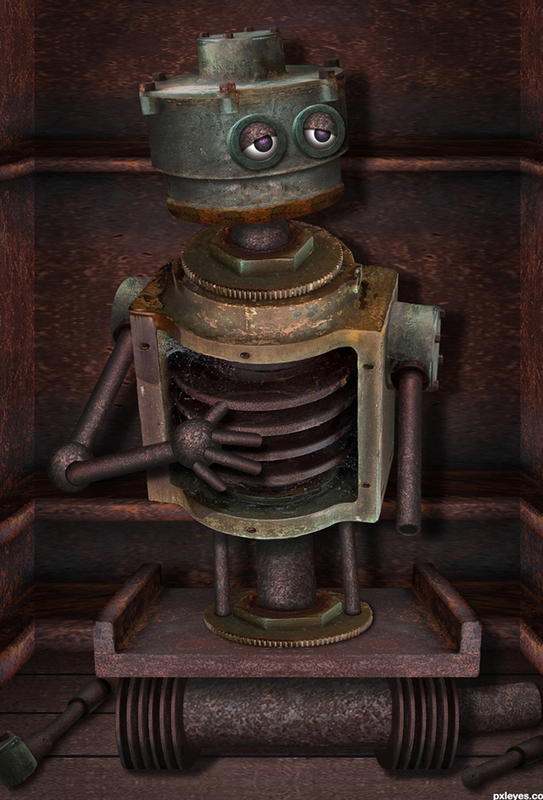 The CS4 Photoshop work was really pretty basic. I used basic shapes and warped them to suit. A good deal of hand drawing was done using the brush tool with a Wacom Intuos 4 tablet. Control is very good and only a little touch up was needed. 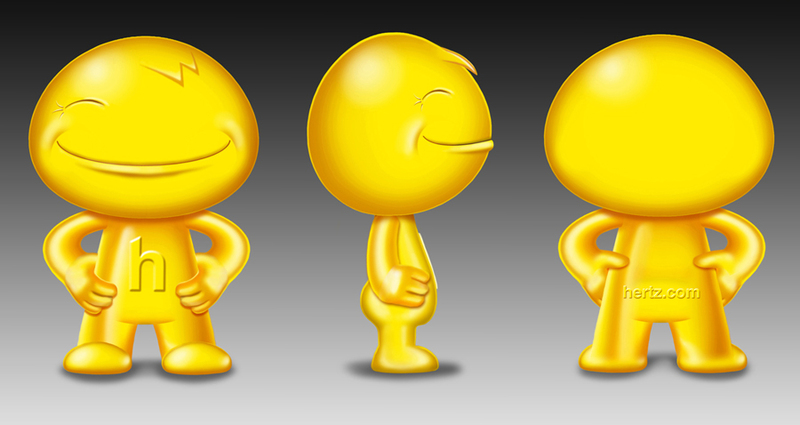 A base layer for each shape was created in yellow and all shading was done on layers placed above. This allowed individual adjustments to be made to highlights, shadows and fill color. This was done for each head and body as a separate group. 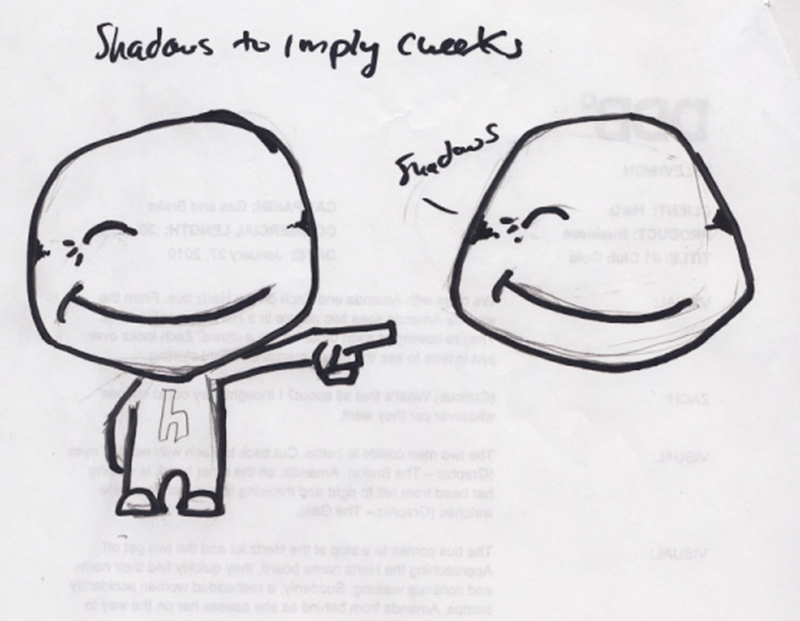 Alternate versions of smiles, winks etc. each had their own light and shade linked to them in groups so I could turn each one on or off completely. Shading was done on multiplied layers with a soft brush on low opacity. Highlights were created with a soft brush also on low opacity and placed on a normal layer. 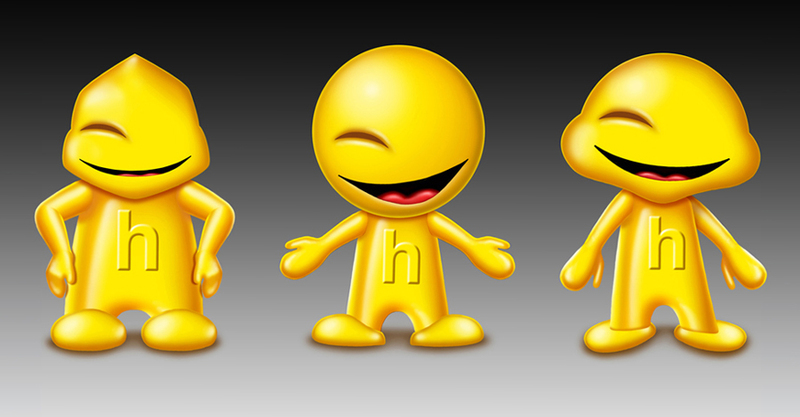 I’ve included some examples of the work as well as a couple of links about the Horatio character. I do hope you’ve found this of interest, it’s not often that an artist’s creation gets high visibility, most of a commercial artist’s work is seen only by those in the industry but even so it’s a rewarding career for a creative individual and Photoshop is an essential tool for the artist today. 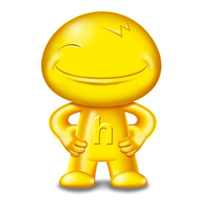 Horatio and all images of this character are copyrighted and the trademark of the Hertz Corporation.